Customised civil room blasting systems. Customised as per size weight of the job. With rail Trolley work car. Shot recovery system Manual Automated. 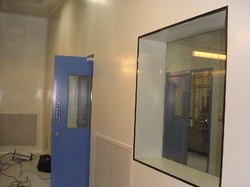 Pharmaceutical companies manufacturing Drugs like Betalactum, Steroid, Harmon or Drugs for cancer required Isolation chambers with their process machinaries to protect the operators as well as environment. We are engaged in offering Clean Room Ceilings that have several unique features to build state-of-the-art Clean Rooms and other controlled environments for various applications. Leveraging over the skills of our qualified team of professionals, we are instrumental in offering wide range of Clean Room Panels. MSHRIY symbol of the manufacturing and supplier Clean room instrument dedicated for pharma's clean room application for continue measurment of envirome such a parameter like Temp, Rh , Dp a, Time , CO/CO2 and VOC. Integrated buzzer is help full to alert. Direct report in FDA 21 CFR part11 norms. Air Flow: 70% Air throw HEPA filter 30% by Exhaust.